Future Market Insights has announced the addition of the “Colloidal Metal Particles Market: Global Industry Analysis 2013 – 2017 and Opportunity Assessment 2018 – 2028" report to their offering. Valley Cottage, United States - March 21, 2019 /MarketersMedia/ — FMI presents an in-depth analysis and key insights on the global colloidal metal particles market in its latest market study titled ‘Colloidal Metal Particles Market: Global Industry Analysis 2013 – 2017 and Opportunity Assessment 2018 – 2028’. The long-term outlook on the global colloidal metal particles market remains positive with the market valued at over US$ 14,542.6 Mn by 2018 end and expected to reach US$ 32,376.5 Mn by 2028 end. The global colloidal metal particles market is estimated to expand at a growth rate of over 8.3%, through the forecast period. Among the product type segments, the titanium oxide colloidal metal particles segment is expected to account for a large volume proportion of the market while the gold colloidal metal particles segment, given its high price, is expected to account for a noteworthy value proportion in the in the colloidal metal particles market during the forecast period. From a regional viewpoint, China is anticipated to hold a sizeable proportion of the market throughout the forecast period, witnessing 7.6% growth between 2018 and 2028. In its latest offering, FMI shares key insights on drivers, restraints and trends likely to impact the colloidal metal particles market during this period. Future Market Insights suggests that the global colloidal metal particles market is estimated to register robust growth throughout the forecast period, prominently due to its rising applications as a catalyst. The chemical industry has been making a shift towards nano scaled catalysts, a move that will prove to be beneficial for the colloidal metal particles market. The enhanced surface area per particle escalates the efficiency of the catalyst, an important factor responsible for increasing the demand for colloidal metal particles within the chemical industry. Colloidal metal particles are also being increasingly used in dietary supplements, either directly or in combination with other ingredients. For instance, copper colloid metal particles are increasingly being used to enhance the human body’s ability to absorb iron particles. Similarly, silver colloidal metal particles are proven to be effective in treating skin conditions, such as acne and chickenpox. They are also effective against various infections. Growing market for dietary supplements, as a whole, is anticipated to have an optimistic impact on the colloidal metal particles market. However, the issue of toxicity has put forth several legislative barriers in the development of the colloidal metal particles market. Some studies have also shown that uncontrolled use of such particles contaminates the environment and hence, country level regulations have been passed to monitor the consumption of the aforementioned colloidal metal particles, among others. The Colloidal Metal Particles market has been categorised on application basis into catalysis & photocatalysis, adsorbent, drug delivery and dietary supplements. Regionally, China alone accounts for a prominent proportion of the global colloidal metal particles market, positioning itself with the likes of multi-country regions, such as North America and Western Europe. Accounting for well over 22% of the revenue proportion in the total colloidal metal particles market, China is anticipated to register significant CAGR during the forecast period. The overall Colloidal Metal Particles market is expected to grow at a CAGR of 8.3% while regions, such as Western Europe, Eastern Europe, and countries, such as India and Japan, are expected to grow at a moderately higher pace owing to rising demand in these regions. 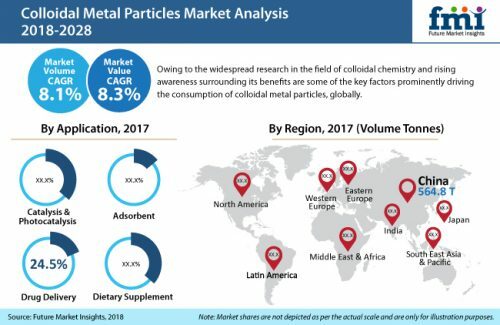 The report highlights some of the top companies operating in the global Colloidal Metal Particles market, including Nouryon BV, Purest Colloids, Inc., Tanaka Holdings Co., Ltd., Evonik Industries AG, IMRA America, Inc, W. R. Grace & Co., SunForce Health & Organics Inc. and BBI Solutions, among others.